North Rim is proud to present the El Capitan Building in Multnomah Village! This 2-tenant retail property is being updated with a fresh facade, interior updates, and seismic upgrades. Each suite will offer its own storefront with signage opportunity, private restroom, and basement. Located in SW Portland, just north of where Hwy 99W and Interstate 5 run parallel, Multnomah Village is a charming suburban area known for its commercial district in the heart of the neighborhood. At the crossroads of SW Capitol Hwy and SW Multnomah Blvd lies a concentration of locally owned businesses commingled with national brands, encompassing everything from cafes, a pub, and wine shop, to gifts and toys, art and antiques, banking and urgent care. This eclectic mix offers the community a small-town-pride with a 'downtown' convenience factor. 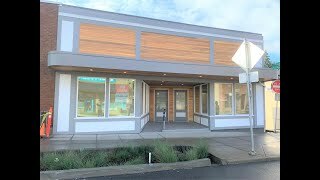 Retail Space	7856 2,326 RSF Renovated Retail Space in Multnomah Village for Rent: $20 NNN Updated storefront with mezzanine and additional space downstairs. Private restroom and signage opportunity. Retail Space	7858 1,588 RSF Multnomah Village Corner Storefront with Basement for Rent: $20 NNN 2-Story retail suite for lease in the El Capitan Building. Coveted corner space with windows and private restroom. Updated facade provides room for signage.